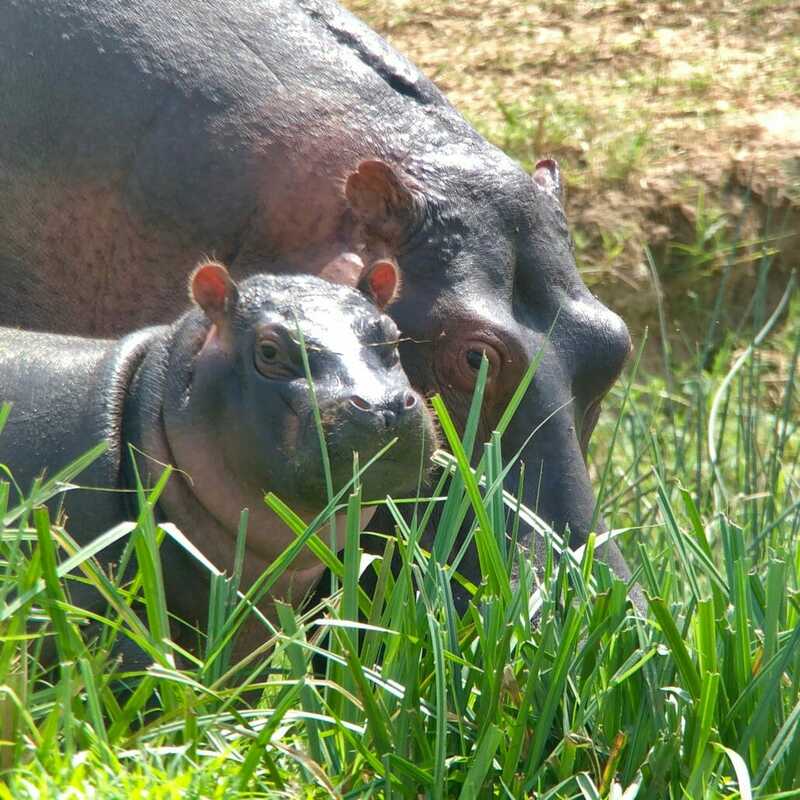 If I heeded advice to not bring my scope on a boat, I would have missed the chance of getting a souvenir shot of a baby hippo. It may not be good enough for the cover of National Geographic, but it’s good enough for my Instagram account. 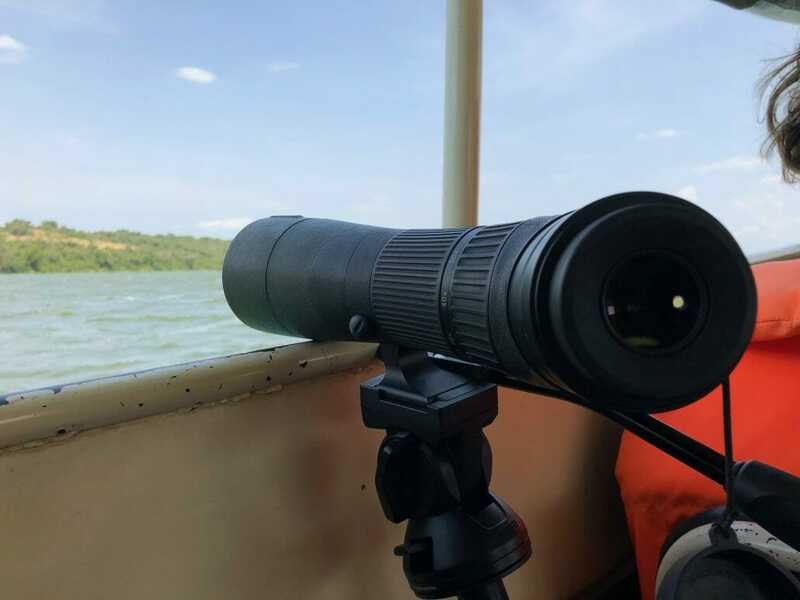 A smartphone is a very forgiving camera and a good spotting scope is rugged, waterproof and ready to take a beating in a boat. Most scopes now have warranties so if something happens, you can get them repaired. The images I have captured while in something that was either moving or vibrating have been quite good. In a case like a once in a lifetime trip to Uganda, even a slightly blurry photo of a hippo or shoebill is preferable to no photo at all. But there’s always a chance that I will get something that is in focus. When people tell me they can’t take pictures like I can I tell them they could if they always take their equipment with them. Here are some tips to help you in highly bumpy circumstances. Let me be clear–birds are jerks. They are one of the least cooperative photo subjects outside of a pet rabbit. 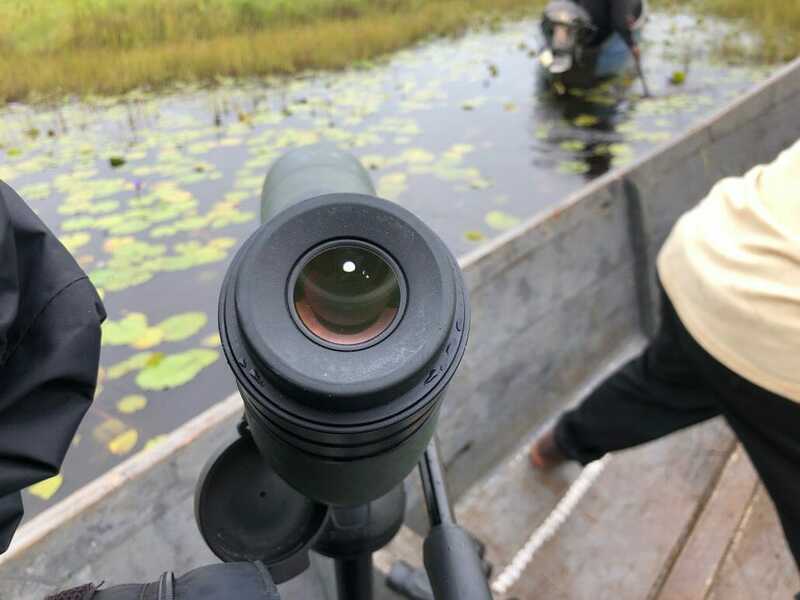 However, the more you practice setting up your scope on a bird, the faster you will become at set up. Sometimes birds surprise you by sitting one spot for a long time or continuously returning to the same perch. Here is a video of a little bee-eater that was being super cooperative on our Uganda trip. 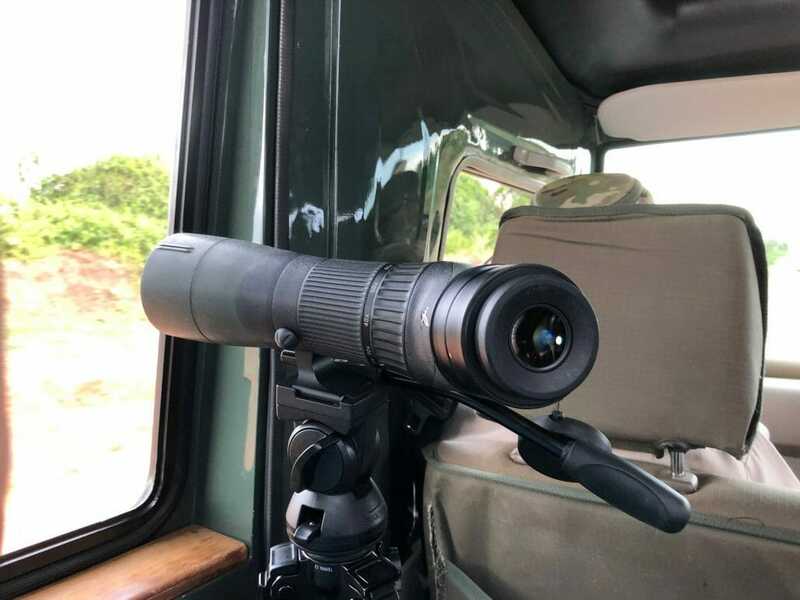 I had so do some fancy leg work in our safari vehicle to get it in the scope but I got pretty cool results. Speaking of video, modern smart phones will take HD video which can be good enough to pause to grab a screenshot. If you have a lot of space on your phone and it has the ability to record in 4K consider that. The quality will be much better and the screenshots will be amazing. But one of the things that I like in an iPhone is that while you are taking video, you can also take pictures at the same. When the video is running, a shutter button appears. I frequently do both. 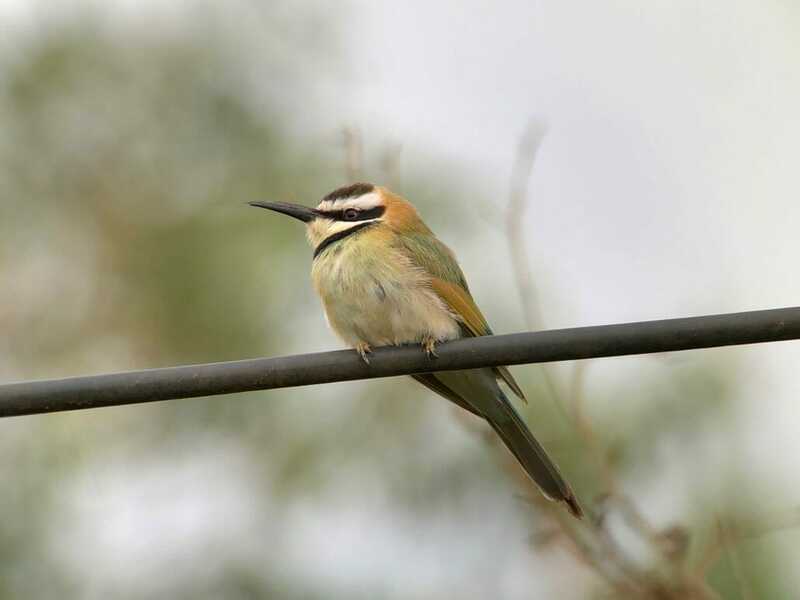 While I was taking video of the above little bee-eater, I also took photos with that shutter button. If you keep your finger pressed on the shutter button on your phone screen, it will take several photos at once. The phone will combine those photos to make the best image. You can also sort through all the photos you took and pick the individual one that’s in focus and delete the rest. 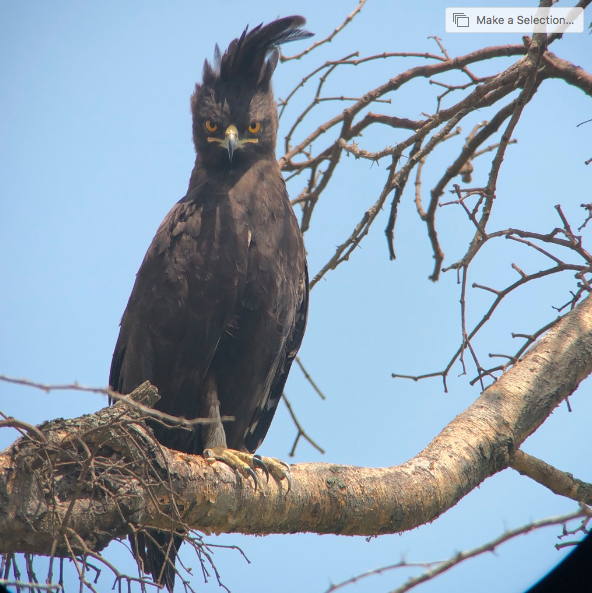 When you open your picture in burst mode, like this one of a long-crested eagle, in your photos app, you will see a little box up in the corner. When you click on that, you will see all the photos you took to make that one photo. 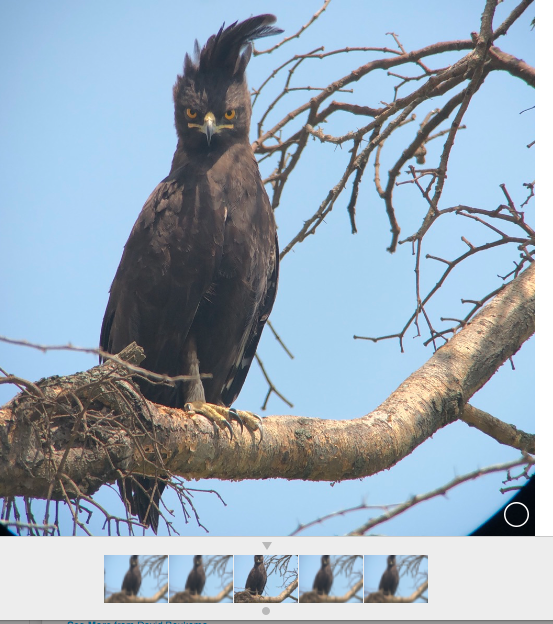 After clicking on the photo, all the photos pop up below so I can delete the the blurry ones or chose use one of the bird mode photos. Sometimes it’s not feasible to put out your tripod legs if there isn’t enough space. Sometimes I will keep them together and then find a way to lean the scope against the window or the edge of a boat. I will sometimes lean my leg on to the tripod legs for extra stability. It may not be great for video, but for photos it works fine. Here I have scope leaning against the side of an open window. The legs are together and my leg is leaning against them to hold the scope in place. Same as the above photo but I’m using the boat edge and leaning the scope on that. This particular boat had enough room not only for me to stand but extend my tripod legs. The video below shows you what went through to get shoebill pictures. The bottom line is to push your equipment–always try. The worst is that you have a blurry photo. The best is you have a great photo of your time out in nature. Either of those two options are preferable to no photo at all.